Join us for a Boutique Shabbas as we explore 3300 years of Jewish wisdom and how it can enrich 21st century life, relationships, and meaning. All of this in the beauty of the Hamptons, as the sounds and sights of spring surround us. Rabbi Manis Friedman. World-renowned author, counselor, lecturer and philosopher, Rabbi Manis Friedman uses ancient wisdom and modern wit as he captivates audiences around the country and the world. Rabbi Friedman started an organization called “It’s Good To Know” which reaches thousands of people every month through his online classes and events. Rabbi Friedman’s first book, Doesn’t Anyone Blush Anymore? published by Harper San Francisco in 1990, was widely praised and is currently in its eighth printing. His next book and Documentary have also been met with praise. Rabbi Friedman is a noted Biblical scholar, recognized for his sagacious grasp of Jewish mysticism. When he takes the podium, Rabbi Manis Friedman enthuses each of his listeners with a sense of purpose and definite direction. Perhaps his greatest gift of all is his balance of compassion and wisdom. 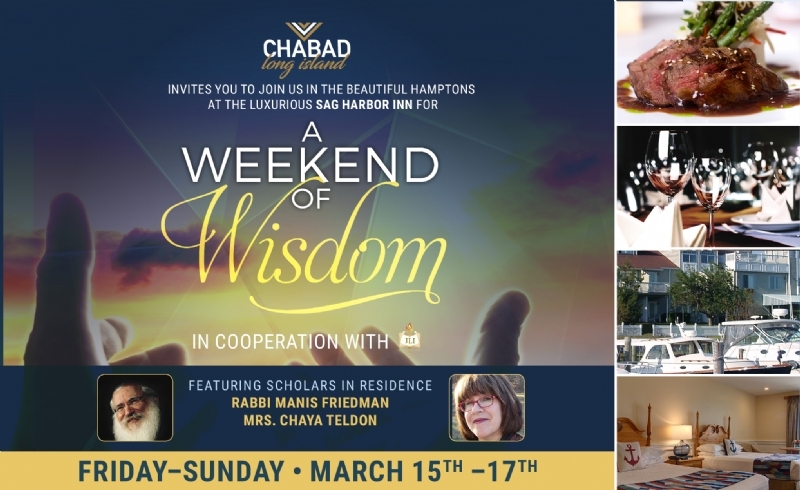 Mrs. Chaya Teldon has been an instrumental part of the growth of Chabad in Long Island and was a co-founder and Program Director of the Chabad Center in Commack for many years. She was also the Principal of The Jewish Academy of Suffolk for 14 years, and now serves as Director of Major Events for Chabad of LI. In addition, she has spoken across the USA (over 30 states), as well as in Australia, England, Ireland, South America, and Israel. Due to her dynamic personality, she was selected by The Oprah Show to represent Chasidic women for the “America's Hidden Culture” special that Oprah personally oversaw. Her goal is to invite every Jew on Long Island to the TeldonShabbat table. Over two hundred years ago, Sag Harbor was a thriving whaling town and bustling seaport, New York’s original entryway. Two centuries later, the historic 18th and 19th-century homes of this quaint village, on the South Fork of Long Island, whisper tales of men at sea and Revolutionary times. The whaling and cargo ships that long ago lined the harbor have been replaced by the delicate masts of modern sailboats and private yachts. The narrow village streets are dotted with trendy boutiques, antique shops and restaurants serving some of the area’s finest international cuisine. In Sag Harbor, you’ll discover the best of both worlds. You’ll find a unique blending of old and new, with historic homes and modern, million-dollar-plus mega mansions each vying for your attention. This storybook village lies between the villages of East Hampton and Southampton, and is just a short drive to Shelter Island (by ferry) or Montauk, the very tip of Long Island. In Sag Harbor, both calm and activity coexist. You’ll feel like you’ve landed in a New England fishing village, but you’re within walking distance of many out-of-the-ordinary shops and stimulating night life. You’re also just a short drive away from challenging golf courses, East End wineries, and ocean beaches.